ISO-Core® "EL" No-clean standard solder wire for hand and automative soldering in the electronics, halide-free activated (1.1.3.B/ROL0), standard flux content 3,5%. No-clean soft-solder wire for high-demand applications in electronic and electrical engineering. 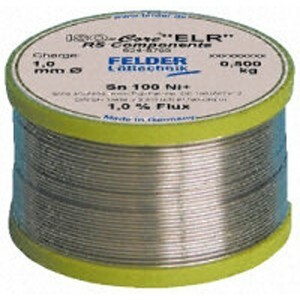 FELDER ISO-Core® solder wires are manufactured of the same . ISO-Core® "EL" No-clean standard solder wire for hand and automative soldering in the electronics, halide-free activated (1.1.3.B/ROL0), standard flux content 3,5%. No-clean soft-solder wire for high-demand applications in electronic and electrical engineering. FELDER ISO-Core® solder wires are manufactured of the same highly pure alloy components according to international standards like FELDER ISO-Tin® electronic solders. The fluxes have a high temperature resistance! The fluxes do not result in corrosion in non-iron metals and have the highest surface resistance values. Therefore, they can remain on the soldering joint. In connection with lead-free alloys Sn95,5Ag3,8Cu0,7 the qualities of „EL“ and „ELR“ were positively rated by Siemens Berlin, certification center CT MM 6, since January 2001.